The measure sponsored by Democrat Rebecca Millett of Cape Elizabeth would allow police and family members to seek a court order to temporarily disarm someone in mental health crisis. AUGUSTA — A bill that would allow police armed with a court order to confiscate guns from people deemed to be a threat to themselves or others because of a mental health crisis is back before the Maine Legislature. The so-called “red flag” bill, sponsored by Sen. Rebecca Millett, D-Cape Elizabeth, is similar to a measure the Legislature passed last year but was vetoed by then-Gov. Paul LePage, a Republican. Millett told a group of supporters at a news conference at the State House on Tuesday that it was time to try again to pass the legislation. “For years we have watched school shootings and deadly cases of domestic violence become more and more common in our country,” said Millett, the Senate chair of the Legislature’s Education Committee. She recalled the story of Amy Lake and her two children, Cody and Monica, who were shot to death by Lake’s estranged husband, Steven Lake, in their Dexter home, before Steven Lake turned the gun on himself in 2011. Millett said had police been allowed to they would have been able to confiscate Steven Lake’s guns. At the time of the killings he was out on bail for holding his family hostage the year before. Millett said there were more recent examples in Maine, including a May 2018 case in which a man caused lockdowns at public schools in Rockland after he told a witness he heard voices telling him to go shoot up a school. Millett said police later recovered five firearms from his home. She also cited a Presque Isle murder-suicide over the weekend in which police say Matthew Leavitt, 35, shot and killed his 14-month-old son, Quinten Leavitt, and then killed himself. Advocates for the bill also cited Maine’s suicide statistics, noting that a Mainer dies from a self-inflicted gunshot wound every three days. Millett also said that half of all youth suicides in Maine are by firearm. The bill, L.D. 1312, would allow police or family members to seek a court order to have police temporarily take an individual’s gun if a judge agreed they were an imminent threat to themselves or others. The measure was introduced Tuesday and had not yet been scheduled for a public hearing, but it was backed by House Speaker Sara Gideon, D-Freeport, among other legislative leaders. The bill vetoed by LePage in 2018 was supported by then-Attorney General Janet Mills, now the state’s Democratic governor. Gideon said other states have passed similar laws allowing for community protection orders and those laws are saving lives. She said opponents will argue that no law can stop every shooting or every act of violence. 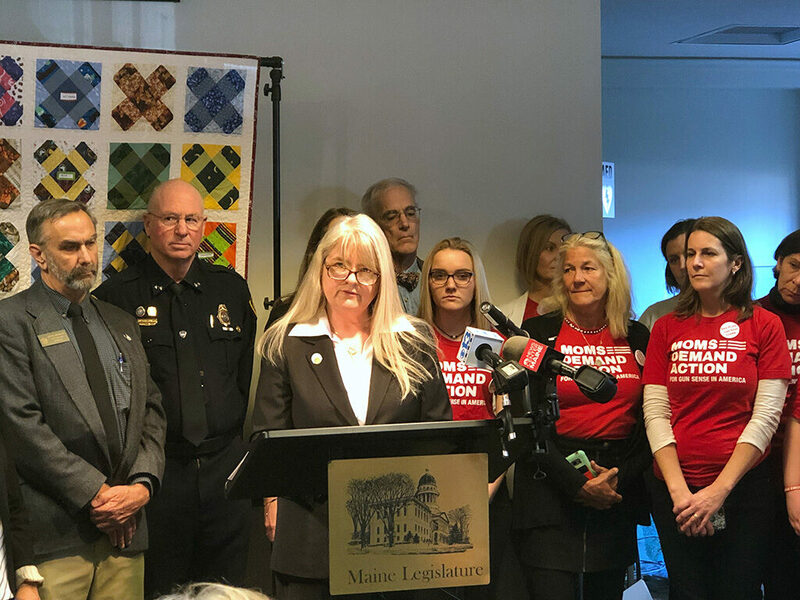 The Maine chapter of Moms Demand Action for Gun Sense in America, part of Everytown for Gun Safety, also offered its support for the measure, with many of the group’s members attending at the news conference. Others backing the legislation included the Maine Chiefs of Police Association. York Police Chief Doug Bracy said law enforcement wants the change, as it will help them protect lives. “We need help,” Bracy said. “There’s a mental health crisis in this country and in this state.” He said when a family comes to police seeking help with a loved one who’s grappling with mental health issues and police can’t offer any, it’s frustrating. “We are not here to take away gun rights, we are here to protect those that shouldn’t have weapons at certain points in their lives,” Bracy said. Critics of the 2018 bill, including groups like Gun Owners of Maine, said at the time that the legislation could be abused by authorities, angry ex-partners or anyone else with a grudge against a gun owner. In 2018 crowds of opponents – many wearing National Rifle Association paraphernalia or labels declaring “Gun rights are civil rights” – decried the bill as infringing on citizens’ rights to bear arms and to due process. Critics have also said seizing guns is unlikely to stop mentally ill individuals or would-be domestic abusers intent on causing harm.